An unguarded, somewhat informal study of poetic struggle and human faith, by the unsinkably prolific Harvard dynast of modern literary criticism. Bloom (Poetry and Repression, Shelley's Mythmaking, etc.) has never been so critically intimate as in this pseudotestimonial on belief and poetry. Personal affinity rather than academic intrigue seems to have determined the literary pantheon surveyed here--beginning with the Hebrew Bible (which he admits to reading in old age as consolation for solitude), ranging through Homer, Dante, Shakespeare, Wordsworth, Freud, Kafka, and Beckett. 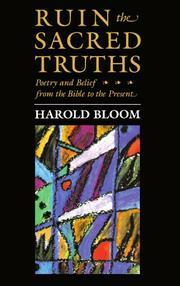 Bloom's elusive subject is the "sublime," defined as the realm of spiritual struggle "between truth and meaning" that provides literature its transcendent moments. For Bloom, Shakespearean sublimity lies in the playwright's "cognitive power"--which, as in the figure of Hamlet, "contains cultural history." For Milton, it is supernal ambition--the faith that his own life "incarnated truth." Freud and the Bible share for Bloom an awesome reverence for authority and memory--an obsession he also finds central to sublimity in Kafka and Beckett. Bloom constructs this majestic rubric with his usual erudition and grace, leavened with in-jokes, witticisms, and surprising jests. French theory is one floating target; his own academic importance is another. Finally, there is deadpan: what does one make of Bloom's claim that Milton's Satan is more like Reagan than Freud? Perhaps Bloom's most accessible book, and probably his most endearing: a bounty of coy surprises and typical leaps of brilliance.